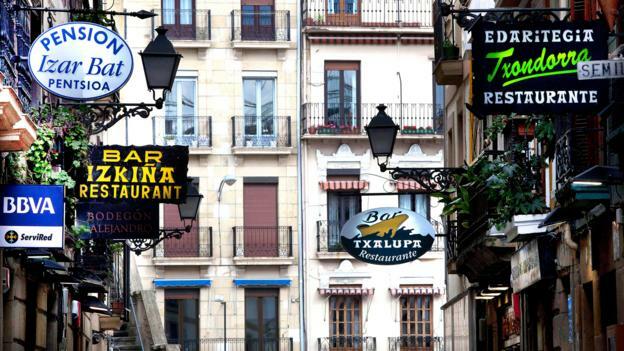 With its abundance of Michelin starred restaurants and celebrated chefs, San Sebastian is widely considered one of the world’s premier culinary destinations. But as tourists clog the Old Town, eating and drinking their way through its narrow streets, another world lies hidden in plain sight. 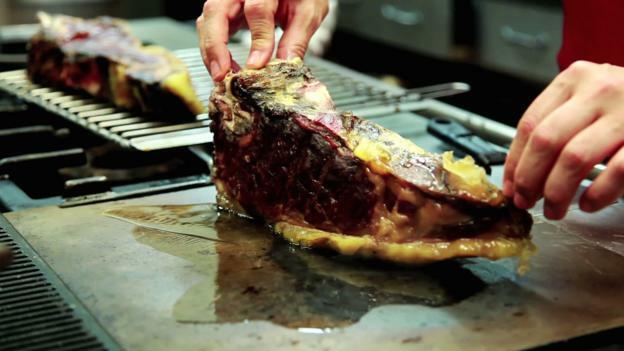 There are hundreds of txokos, or secret gastronomic societies, scattered around Spain’s Basque country. Secure an invite to one, I was told, and you’ll see how the region’s proud yet somewhat reserved people open up around the common bond of good food and drink. When I asked Paulo Rodriguez, owner of Pension Aia, about going to a txoko (which have traditionally been all male), his response wasn’t encouraging. “I don’t know, mate,” he said. “We’ve had guests ask about visiting these societies, but the answer we always get is that they are private clubs – they don’t open their doors to tourists.” However, Rodriguez’ wife, Idoia Zabala, offered to introduce me to the husband of a woman in her choir who is a member of Kanoyetan, reputed to be the city’s oldest society at 115 years and counting. At Kanoyetan (31 de Agosto Kalea), just off the Old Town’s principal street, the door’s stone trim looks solid enough to withstand a catastrophic earthquake. But the nondescript sign above the door gives no hint as to what’s inside. As I entered, I could hear the buzz of conversation and drinks being poured. Club president Gabrielle Otegui Polit and long-time member Txema Garay Iribaren greeted me warmly, showing me around what is essentially a large dining room plus a fully stocked kitchen and bar area. Food, wine and cider are taken very seriously here, and there are few other distractions. “We come here to eat, drink, socialize – not to watch TV,” Polit explained. Everyone cooks and serves themselves, and then fills out a menu and drops it in a small wooden honour box along with cash for the items they consume. Iribaren insisted that it’s unheard of for anyone to steal from the club, which is like a second family. “This is like our refuge – our kingdom,” Polit said. Martín Berasategui, a famous chef who holds a total of eight Michelin stars, is the club’s best known member. But just about everyone tries to impress their friends by finding the best ingredients, experimenting with new recipes and taking risks in the kitchen. 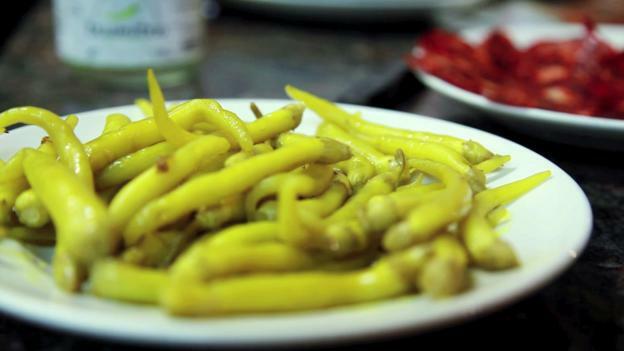 Polit’s specialty is grilled hake and Iribaren’s is chipirones (baby squid). Over glasses of tart hard cider (poured just a finger at a time), slabs of spicy Burgos morcilla (a type of blood sausage) and some buttery Idiazabal cheese, the men told me about their society, which was formed in 1900 by a group of about 100 men who had a passion for food and wine. There are no women here, so at least we know they are safe. They can’t cheat. Kanoyetan, like the other gastronomic societies in the Basque country, thrived because they offered men – and only men – private spaces to gather outside their homes, where their wives traditionally called the shots. About 100 years ago, club members even refused entry to Queen Maria Christina. “They offered to give her some takeaway – kokotxa [the fleshy area of a fish’s jaw] to bring back to the palace,” Polit said. Sharing a common love of good food and drink, these clubs were and still are egalitarian spaces, where judges and doctors rub shoulders with labourers on equal footing. However, given the limited space in the dining room and kitchen, it can be hard to get in. Kanoyetan, for example, cannot accept more than 125 members, and there is a long waiting list to secure membership. “Even though I’m president, I can’t automatically help my sons become members,” Polit said in between bites of sausage. At Kanoyetan, if a member dies, membership is automatically offered to the man’s oldest son. Otherwise, members can nominate newcomers from the waiting list. The names of prospective members are posted on a bulletin board for 15 days. “If even one member objects for any reason, they cannot become members,” Iribaren said. Despite waiting lists, the future of these clubs is somewhat uncertain as the cost becomes prohibitive for younger members to join. Spain’s dismal economy, which has hit 20 and 30-year-olds hardest, has left many cutting back on all but the bare essentials. And there is the matter of time. Unlike their fathers, younger Spanish men are expected to play a more active role in child rearing and work around the house, and it’s harder for them to justify joining a club where their wives and children are not welcome. However, times are slowly changing, and a number of all-male gastronomic societies have gone co-ed in recent years. Kanoyetan is still an all-male society, but women can now visit – if accompanied by a member – so long as they stay out of the kitchen, which is considered a sacred place where men can cook on their own terms. And up until a few months ago, women weren’t allowed to enter the club on Fridays, but that prohibition has also been lifted. Still, not everyone is satisfied with the pace of change. 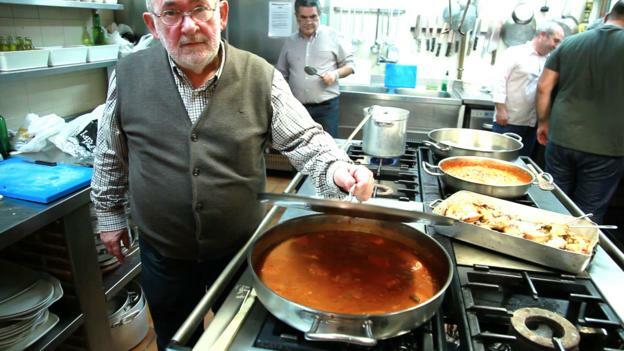 Xabier De La Maza Aramburu, a 32-year-old culinary entrepreneur and member of Cofradía Vasca de Gastronomía (Basque Culinary Brotherhood), said that his club, founded about 60 years ago, has been co-ed for about 20 years. Despite that, about 90% of its 300 or so members are men. He thinks that the looming issue for most gastronomic societies isn’t just including women, but also children, because younger members like to bring their families to the clubs, something that not everyone likes. 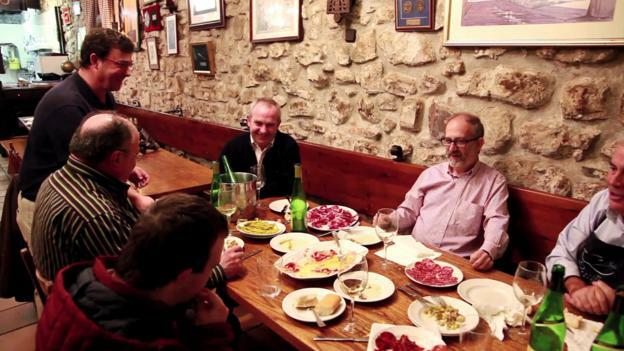 In Basque country, it’s normal to have three meals a day, starting with gosaria (breakfast) followed by bazkaria (lunch), the principal meal of the day. Cena (dinner) typically starts at 9 pm or later. Plus, on weekends, hamaiketako (a light meal at 11 am or noon) is common. As for travellers, the only real way to experience these societies is to secure an invitation, join a tour like Garra’s or visit on 20 January for the Tamborrada of Donostia festival, when many of the clubs are open to the public. 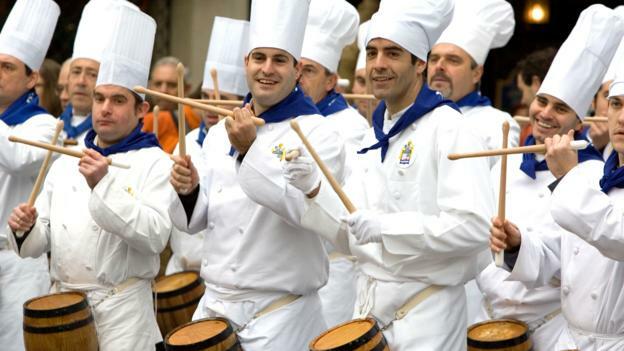 Turn up in San Sebastian during the 24-hours of drumming and pageantry, and witness the passion that club members have for gastronomy, their Basque culture and each other. Just don’t expect them to share their recipes or reveal all their secrets.